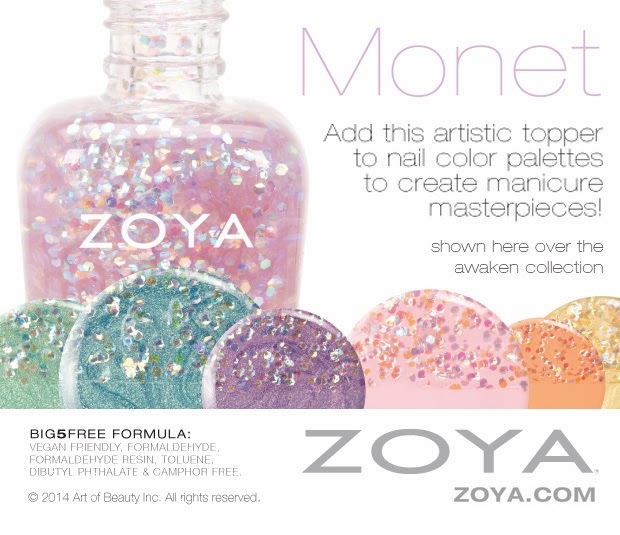 The new Zoya Awaken collection for 2014! One thing I will comment on is the recent influx of, well, not exactly male names, as a lot of names are gender neutral nowadays, but male-sounding names. I don't know any women named Hudson. Or Cole. But if you're out there, here are your polishes! Cole is Stella from the most recent Peter Som box. I have that one. Dillon: Green Mint Shimmer Metallic Full Coverage Formula. Rebel: Blue Sky Shimmer Metallic, Full Coverage Formula. Dot: Pink Petal Cream, Full Coverage Formula (originally created for fashion designer Zang Toi’s SS14 collection). Cole: Peach Whisper Cream, Full Coverage Formula (originally created for fashion designer Peter Som’s SS14 collection). Brooklyn: White-Gold Shimmer Metallic, Full Coverage Formula.